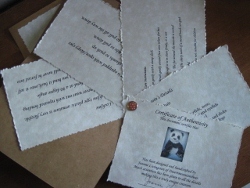 I am just finishing up making Certificates of Authenticity for some bears I have just finished. I really don't like doing them. They are work, each one individual for each bear made. I know for myself I put them away in a drawer. When I buy a bear I plan on never selling it, so for me they don't matter. I do always keep the hang tag on the bear though. But I have had collectors ask if there is one. As bear collectors do they matter to you? What is important to be packed with the bear? I would really like to know. 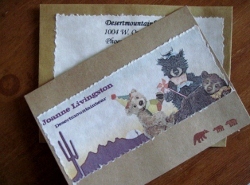 Joanne, the traveling papers you make for your bears are really sweet. Personally, I put them away along with the hang tag if there is one, but I do like having something with a description of the bear, and preferably a photo, too. So I guess I'm fine with either a COA/passport/birth certificate or a hang tag (preferably laminated if it' s hang tag). Due to my compulsive nature I may need to sell a bear or two in the future, so something from the artist is nice to have. Thanks Becky, so if it is a hang tag you want the bears details on it? What it is made of etc? I collect bears for their "cuteness" and also I adopt from artists who I admire and like as people too. The COAs are good to have but don't mean as much to me as the actual bear. My bears all have hang-tags that are four sided like a little book. First side says GJOYful Bears etc, 2nd says the bear's name and who it was designed and made by plus which range or collection it comes from (I have collections and ranges of bears). 3rd states the other collections and ranges available and that the bear is not for children under the age of 14. And 4th side says in very small print a short thank you for adopting a GJOYful Bear, it also will state if the bear contains garnet and finally a short note about copyright before saying it is hand-made in Victoria, Australia. All my mohair bears also come home with a one-page info sheet I print out about mohair and how to care for it, and in the unlikely event of bugs etc chewing on your mohair bear it tells the customer how to fix the problem. All of my custom ordered bears also come with "birth certificates" to state they are OOAK (not all my bears are - just some, and lots of customers like to know they're bear is an OOAK if it is so Birth certs are good) etc. Your bears are all OOAK aren't they Joanne? So COAs are probably a good idea to have. Thank you for the info Gabriele. I removed my OOAK label from the realistic bears. They are all unique and individual, but since I do reuse my patterns and I am making bears that look more real I felt that I should remove that label. I could never duplicate one if I wanted too, but a baby black bear is a baby black bear. 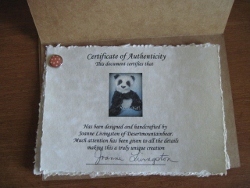 On my COA I state that the bear has been designed and handcrafted by Joanne Livingston. Here is one I just finished. They are all basically the same, they change a little with the stationary I have at the time. 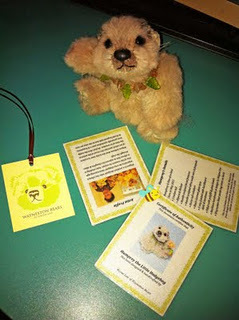 Inside is the certificate, then the bear's details, the care instructions, the lockline info and the open close eyes info. I adjust it depending on what details the bears have. Can I put this all on a hang-tag? Do collectors keep it all? so if it is a hang tag you want the bears details on it? What it is made of etc? Yes, I do want that info at least. But the other info that you provide is a nice extra. For my own bears, I don't use a hang tag (sewn-in tush tag instead), but I do include a COA with a photo, materials list, care instructions, and a little info about me. It would take one ginormous hang tag to fit all of that! Sorry I also forgot to mention along with my hang-tag I also have a slightly larger square tag with a dot-point of list of materials and everything that makes up the bear. All my info fits on these but I do really try to make it all fit lol. It takes some thinking and re-organizing. Joanne I love the look of your COAs they look great. While I am talking to you can I please ask you if you do custom orders? I don't mean custom as in the customer chooses all the details I mean if I asked for a baby black bear and you did everything your way but it would be reserved for your customer, do you do that? I'm interested to know because I'd love to adopt one of your bears but I have the feeling they're probably difficult to adopt in time before someone else adopts them lol. That is very nice Gabriele. I do not do custom work. I keep a mailing list and when there is a bear available I contact the list. You can find that on my website or blog. Thanks for getting back to me Joanne, that's fine I can understand why you don't do custom work (I think you'd be overwhelmed with orders if you did). I am already on your mailing list and eagerly awaiting the next bear you finish. Personally I like to get a certificate, but I suppose it's only useful if there's a way to check it hasn't been faked, or else there's not much point. I think that it depends on the collector and their reasons for buying. I buy a lot of different things like that, I always buy because I want it and want to own and enjoy it; but there are those out there who buy for investment. Of course, I don't think an artist bear is usually an investment piece as usually it's a good way to loose a pile of money if buying direct from the artist and selling on - IMO they loose a lot of value on the secondary market. Having said that, buying on the secondary market is a great way to get a bear that you couldn't have afforded new. I have three of Jenny Loves Benny Bears. Two were purchased direct from Jenny and one is second hand. The second hand one cost me less than half of what the same style of bear cost me new. The hangtag etc matches my bears purchased direct from Jenny - so that bit of paper allowed me to compare and I am 100% certain that my second hand bear is genuine. 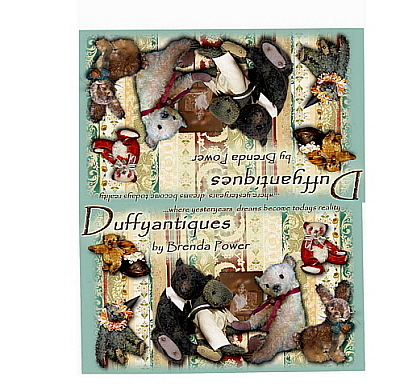 This is maybe more important in the case of that particular artist as she does sell patterns of the same bear. Thank you for your input Jaina, I appreciate it. That's really interesting ThomasAdam, I often tell my new customers this kind of thing in emails when they decide to adopt a bear but often the replies I get are short and curt so I often think I'm the only one who thinks it's interesting. For example I made my first fox bear after my "pet" real fox first turned up at my house etc. I like to tell people all about that kind of thing (I'm a real chatterbox lol) but often I don't feel it's appreciated from customers. It's good to know some collectors like to hear this kind of information from the artist. I know what you mean, I received an amazing bear from Russia after waiting over 2 mons and worrying if it was ever going to make it in the mail. When it arrived the bear was wonderful, but there was no presentation, in plastic with no label, hangtag, nothing. It is like the artist doesn't care. However when I have received bears beautifully wrapped and the care shows through it makes the whole experience so much better. Thank you for that response, and that does lead me to another question, "How important is presentation?" To you I can see it is a lot. And I must admit I like receiving "presents" in the mail, even if it is just an order of felt. I see that often when I order on line I do receive that order wrapped. It feels like Christmas. I wrap the bears, either in cellophane with a bow, or with bubble wrap and then tissue and a ribbon. Glad to hear that it matters. Joanne, I just noticed this thread. I don't really mind not having a COA but I like my hang tags, which I keep with the bear. I hand write all my hang tags each time I sell a bear, and it includes pretty much the info you have on your COA. Size, kind of mohair, stuffing, eyes, paw pads and description of any clothes or accessories. 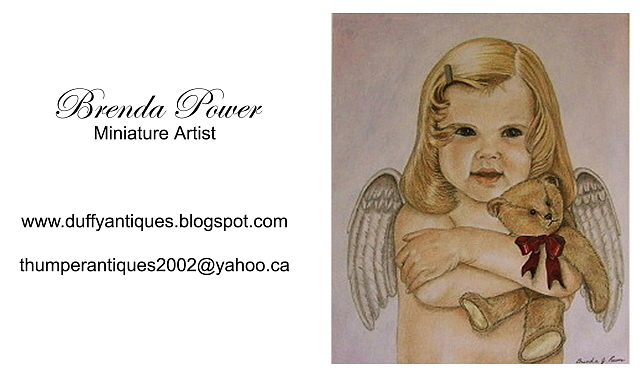 I use a copy of a coloured pencil portrait I did our our daughter as a toddler, on the front and it's roughly 2 x 4" and it folds like a book - info goes on one side and my signature is on the left an my blog address is on the back. How beautiful Brenda, thank you for showing. I'm glad to know this. For me, I really don't think about the tags. I take them off and I keep them if they came off of an artist bear because I know the artist put a lot of work into that part, but I really don't care about the tags or whatever that much. I just care about the bear, but I also can't see, so that probably makes a difference. Joanne and Janice, I wanted to say that I really love your COA, the travelling papers and presentation. In the past I only attached a laminated piece of my swing tags to my bears. After having two of Joanne's Bears and 2 of Janice's mice, you made me wanted to make one for my collectors as well! I enjoy the process of arriving the gift and unwrapping the parcel. For myself, i always use a beautiful box for my bears. The box will be wrapped with brown paper so that I can write address on the outside. I might not be very fanciful with the overall presentation, but I do hope that the box would add some bonus points to my bears. Thank you! I'm glad you like the way I send my bears. I try to make each one as if it were a present for the collector. My Mom was one who wrapped her packages beautifully and I think I learned from her. I like to imagine the person opening it and I want to make sure they are smiling when they open that box! 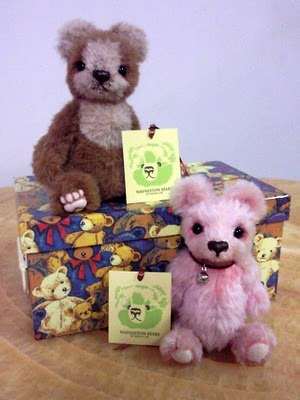 I pack my smaller bears in a gift box with bubble wrap first then the post parcel or box. Everything about the bear etc is in the gift box part. I have to say I won't name names of some of the artist bears I've received that were poorly packed but I will say that Silke Borrmann's bears ("The Mountaineers") are not only stunning bears and so professionally made, but they are packed SOOOOOOOOO amazingly for their new owners. She puts them in a very large post box with lots of bubble wrap, and the actual bear is wrapped first in nice tissue paper and then in a stronger red or other colour tissue paper (the non-tear, paper like kind). This is gathered at the top near the head of the bear, and tied with grass reed-like ties (amazing string-like stuff) and then she has stars, flowers and other beautiful cut-out shapes with holes in the center that sit around the gathered and tied tissue. It's absolutely stunning. I am always eager to undo the package and see the bear but I can never help myself when I receive one of her bears, I have to sit and marvel just for a moment at the wrapping of the package. Jesse, I know for you the bear is forever, so I can see why papers are not that important. Wayne, I am so glad to see you here. I was so impressed with the packaging and tagging of your monkey that I have. Probably more impressed than any in my collection. I really did feel like I was receiving a special gift. Which I was. Gabriele, you are like me enjoying the unwrapping process. And Janice, you are the person that got me thinking about the whole presentation. When you handed me that box that day with my bunny so beautifully wrapped and told me you do it for everyone I was so impressed. Yes I did read this before. And I have to think on this. When I post a bear on ebay, most of this info is included in that presentation. But I never thought to include it in with the bear. I am not so good at writing things like this so well. But maybe I could include a printed copy of what was written in the auction. Thank you for this input Thomas. I guess you are confirming what is being said Eddy, and while I am spending all the time preparing the bear to ship, it does help to know it matters.